A Seven-segment display (SSD), or seven-segment indicator, is a form of electronic display device for displaying decimal numerals that is an alternative to the more complex dot matrix displays. Seven-segment displays are widely used in digital clocks, electronic meters, basic calculators, and other electronic devices that display numerical information. 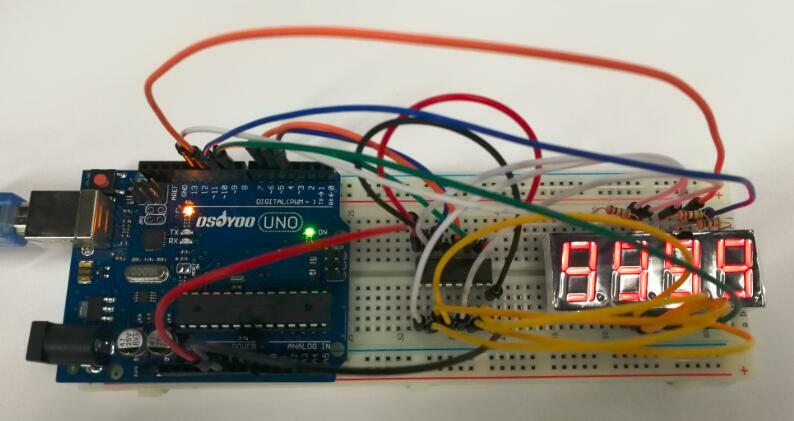 In this lesson, we will be showing you how a 4 digit 7 segment display works and how to use a 4 digit 7 segment display with arduino. Overhere, we are using the common cathode 4 digit 7 segment display. Either a compact module containing four 7- segment LED displays can be used or four individual 7 – segment displays can be used by multiplexing them. Now we are going to see how to interface 4 digit 7 segment display with arduino. We are going to use a different method to control this Four digit display. Let’s see the pinout of this 4 digit 7 segment display. A 4-digit 7-segment LED display has 12 pins. 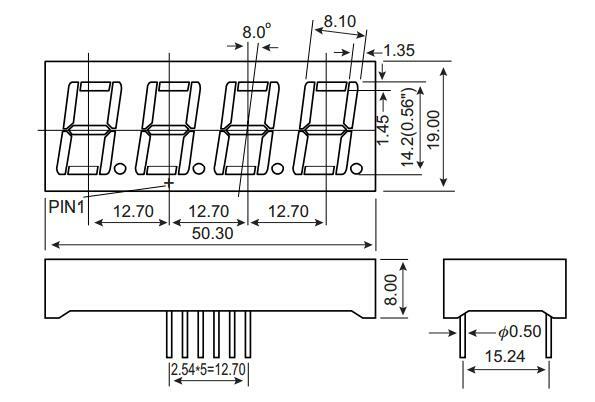 8 of the pins are for the 8 LEDs on each of the 7 segment displays, which includes A-G and DP (decimal point). The other 4 pins represent each of the 4 digits from D1-D4. Each segment in the display module is multiplexed, meaning it shares the same anode connection points. And each of the four digits in the module have their own common cathode connection point. This allows each digit to be turned on or off independently. Also, this multiplexing technique turns the massive amount of microcontroller pins necessary to control a display into just eleven or twelve (in place of thirty-two)! So how we are going to display a number like 1234 on this 4 digit display? For this we are going to use a method called multiplexing. What multiplexing does is simple – show one digit at a time on a display unit and switch between display units very fast. Due to persistence of vision, human eye can not differentiate between which display is ON/OFF. The human eye just visualizes all the 4 display units to be ON all the time. Let’s say we need to show 1234. First we turn on the segments relevant to “1” and turn on the 1st display unit. Then we send signals to show “2”, turn off 1st display unit and turn on 2nd display unit. We repeat this process for next two numbers and switching between display units should be done very fast (about within one second delay). As our eyes can’t pick a change occurring repeatedly to any object within 1 second, what we see is 1234 appearing on the display at the same time. 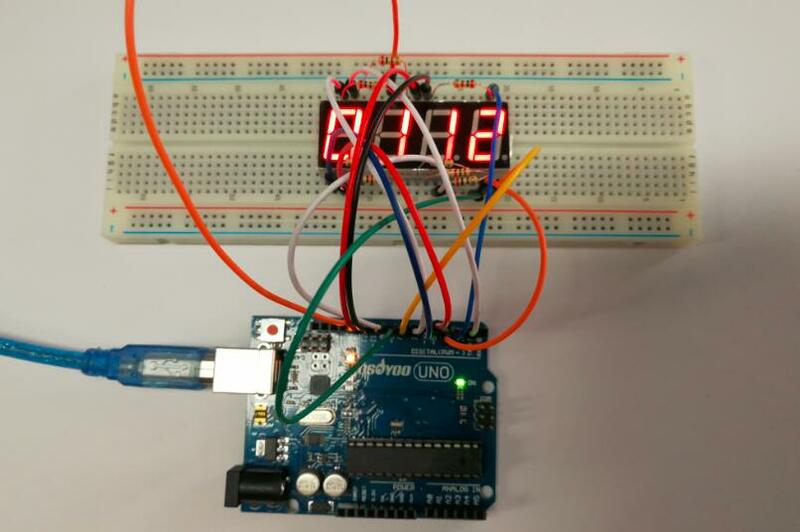 In this example we will use a 4-digit 7-segment display to make a stopwatch, you can see the number increases by one per second on the 4-digit 7-segment display. 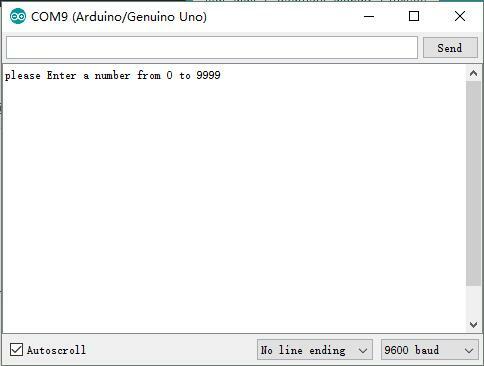 Before you upload the code to your arduino board, make sure you have installed the Arduino library – TimerOne.h. long n = 0;// n represents the value displayed on the LED display. For example, when n=0, 0000 is displayed. The maximum value is 9999. As you can see in the diagram we are using an IC named 74HC595 in addition to arduino uno and 4 digit seven segment display. 74HC595 – is a shift register IC and it converts serial data to parallel data. This shift register IC is used to reduce the number of digital I/O pins of arduino required to control the 7 segment display. As obvious from the circuit diagram, we need only 3 arduino digital pins (connected to shift register IC) to control 8 segment lines of 4 digit seven segment display. 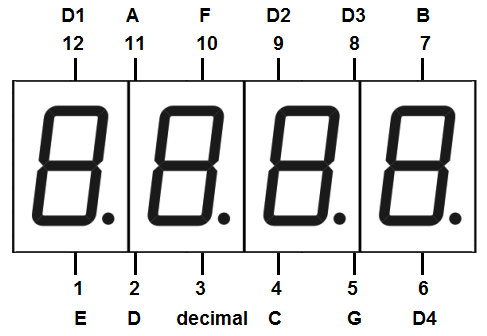 All the segments of 7 segment display are connected to the parallel data output pins of the shift register. Clock, latch and serial data pins of the shift register are connected to arduino digital pins 6,5 & 4 respectively. Each of the four common anode pins are connected to a unique arduino pin (9,10,11 and 12) through a 200Ω resistor to limit the current. After above operations are completed, connect the Arduino board to your computer using the USB cable. The green power LED (labelled PWR) should go on.Open the Arduino IDE and choose corresponding board type and port type for you project. Then load up the following code onto your Arduino. You need to install the timer library before you compile this code. Download the library and install it into your arduino library. Important code lines are commented in the code. In this code you can send any number from 0 – 9999 through the serial monitor (refer the image given above). We are using the arduino timer interrupts to switch between digits. The segments should be turn on and off for each number is stored in a byte array. In the loop() – serial values are read and converted to int and then to long data types. Then this long data is broke in to single digits by break_number () method. Multiplexing is done by the timer class every() function and it calls display_number() method once every millisecond. This method use arduino shiftOut () function to send signals to shift register. Note how latch pin is turned LOW before we send data and turned HIGH after sending data. The function called cathode_high() is to turn off the screen. What changes to be made in the code?